The story of the Universidad Nacional Autonóma de México (UNAM) presents us with a real-life history of “what could have been” at the University of California—what could be, if we organize ourselves to bring the university to a standstill. The students at UNAM occupied their campus—shutting down the school for more than nine months—to fight for a free and open education. They won their immediate demands, but failed to transform society. How long could we last…? UNAM is the largest university in North America, with over 250,000 students. The university’s main campus is in Mexico City, but there are satellite campuses located throughout the country. For as long as it has existed, UNAM has been virtually free to attend and open to everyone who wanted to learn. The fact that it is free has some basis in the founding document of the Mexican state: after the Revolution of 1910, free education was written into article three of the constitution. It is not clear, however, whether that article applies to higher education. Nevertheless, UNAM has charged virtually no tuition for years. Periodically—and especially after the Mexican debt crisis of 1982—the government has tried to charge for attending the university: once in 1986 and again in 1992. In each case, large and disruptive student movements were able to prevent any increase in fees. In 1987, the administration tried to institute a more selective, competitive admissions process. But they underestimated student commitment to UNAM’s egalitarian mission: mass demonstrations effectively overturned their efforts. The largest student strike at UNAM occurred in 1999. That year, the federal government cut university funding by US$30 million, ostensibly in response to falling oil revenues. The administration saw this temporary crisis as an opportunity to introduce a permanent fee increase—from a nominal two cents per term to about US$90 per term. While small by US standards, these higher fees would have made it impossible for the poor to attend UNAM. 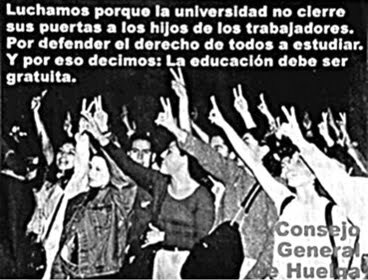 On April 20, 1999, students and supporters occupied many of the facilities and schools of the university. The takeover came quickly after the administration announced its General Regulation of Payment, which would require that all students pay tuition. Student support for the strike was relatively strong at first, but in late April, counter-strikers appeared on the main UNAM campus. These counter-strikers were defeated, however, by a May 12 rally to support the strike in which 100,000 protestors representing students, faculty, staff and labor unions marched to the historic Zocalo in downtown Mexico City. In early June, the Rector backed off of his initial demand for tuition payments from all students and stated that only those who could afford to pay would be required to do so. Students rejected this offer, since it was unclear who would make such determinations. A few weeks later, the Rector tried again, stating that tuition payments would be voluntary and that strikers would be immune from university sanctions. Again the students rejected the offer. In July, the spring semester officially ended and the administration offered to discuss demands, but only if the occupation were ended. Still the students refused. As the occupation wore on, the strikers were radicalized. They no longer wanted only to restore the status quo, without fees or entrance exams. They called for real autonomy—democratic self-management without fear of the repressive apparatus of the state police. But these more expansive demands failed (as we would expect, since it is impossible to really transform society without a generalized social insurrection, reaching beyond the students to other workers). On February 6, more than 9 months after the strike began, 2,400 federal police raided the main campus and detained more than 400 striking students, putting an end to the occupation. However, because of their collective struggle, the students won continued freedom of access to the university. One student summarized his position so clearly that it is worth quoting him in full: “The media obviously omits a lot of things. They make the students look like villains for ‘kidnapping’ the University, but let’s not forget how our ‘intelligent’ government, from the very beginning, began to cut back funding for the public universities so that they could pay the bankers. There is no doubt that this is a national issue, and that the students have to pay a price to sustain accessible schools. The fact is that this is a country where the majority of people are poor and cannot pay.” Sound familiar? Occupy the UCs!